This discussion is very interesting, especially in it's development over the days. I'd really like to thank everyone who has participated!! I'd also like to add two (unrelated) comments, for what they are worth. First of all, a very good friend of mine once said that **everything** man has touched since the Fall he has managed to corrupt. Everything. Just look around you. Just look at history. All of history. And that includes the Church. Just re-read this thread. Secondly, at The Judgment, at which according to the Antiochian Orthodox Divine Liturgy,we will be called upon to offer "a good defense before the awful judgment seat of the Lord" (did I get that right? ), will God ask us if we were Orthodox, or Anglican, or Roman Catholic? Will He ask us if we partook of Holy Communion from a priest that was in communion with the "correct" Church? I wonder just *what* He will ask us. And, speaking only for myself here, I really do not think I will have "a good defense...". Lord have mercy on me, a sinner! We are not saying that the Lord will have no mercy on any of those who were not knowingly grafted onto his Body, the Church. No limit can be placed on God's mercy. You are attacking a strawman. You need to relax, my friend, and stop seeing exclusivism as inherently malicious. Not everything man can touch is corruptible, let alone corrupted. Be careful, the gnostics are always trying to gain ground. 1. It's a well known and documented fact that the upper echelons (and not only) of the Romanian Orthodox Church have been cooperant to the communist regime in general and to the secret police Securitate in particular. Of these people, Metropolitan Corneanu is the among the very few who, after the fall of communism, came out and made a public confession of his colaboration with the Securitate, a public apology to the people he gave information on. In stark contrast to Metropolitan Corneanu's attitude, the rest of the Romanian Orthodox Church hierarchy has opposed, over the years, all legislative atempts to make the Securitate files public, particulary those of high ranking Church officials. 2. The second point where Metropolitan Corneanu went in opposite directions with the rest of Romanian Orthodox Church concerns the property of the Greek Catholic Church. As you know, the Romanian Church United with Rome, Greek Catholic, was oulawed by the communists in 1948, and all of it's posessions were given to the Orthodox Church. Following the fall of the communist regime, the Greek Catholic Church became a legal cult again, and one would expect that the property of wich it was forcibly deposed would be returned ti it. However, 20 years later, the majority of Greek Catholic Cchurches are still being fought over in the courts of law. The orthodox simply refuse to let go, despite these churches having been built by the greek catholic. Again, in stark conrtast to this attitude stood Metropolitan Corneanu, who, imediatelly after the fall of communism, instructed every parish priest in his eparchy to allow the rightful owners of the churches to take posesions of their property and to begin worshiping in the temples built by their fathers, including the Greek Catholic Catedral in Lugoj. One need not be a genius to realise that such actions did not make the Metropolitan popular with the rest of the Church. As such, the episode where he dared to aproach the Body and Blood of Christ in the church of the much hated Greek Catholics was the icing on the cake. By the way, I live 5 minutes away from the very church where the whole thing took place. To this day, acts of vandalism take place there; the Vatican Flag is often ripped from it's place, and not three months ago the main door of the church was set on fire during the night. Ialmisry, I see you keep bringing up the Holy Sinod of Romania. I wonder how familiar you are with the actual relations between the Orthodox and Greek-Catholic churches in Romania. Fairly familiar: the mother of my sons is Romanian, I've been to Romania twice, know Romanian, and I know plenty of Romanians. The case of Metropolitan Corneanu, for example. I wonder if you know the exact circumstances regarding his relationship with the Orthodox Sinod, as regarding the Greek-Catholic Church. Yes, but you seem to have something specific in mind:what is it? Can someone more familiar with this situation chime in and say whether the story is accurate? The report is extremely biased, but if you say bottom line "is the Orthodox in a battle with the "Romanian Church united with Rome, Greek Catholic" (the official title), the answer is yes. A fact only alluded too but not discussed is that even if you go by the Vatican figures, less than half of the Romanians "united with Rome" have gone back, although they were quite free to do so for decades now. According to the census figures, it is even lower, only about a tenth. The "Union of Alba-Iulia 1699-1701" (the scheme in question) was enforced by imperial decree of Leopold I, and confiscated all Orthodox properties: Orthodox communion being declared treason (this is following edict to outright exterminate the "schismatic Vlachs" i.e. the Romanian Orthodox). When the Orthodox majority refused to sign on for decades, and began erecting their own temples and monasteries, Marie Therese sent Buccow to destroy them all. Even then, she finally in 1759 had to recognize officially that the Orthodox didn't disappear. Despite Imperial support, the number of those in the union began to drop. The figure of two million is often given by church in question: the figures for that don't add up. The "Catholic Encyclopedia" 1909 gives 1,750,000 Orthodox Romanians in Transylvania, and 1,300,000 for the Romanians under the Vatican in Hungary, the majority, but not the totality, residing in Transylvania. (the census of 1900 for Hungary (CE "Hungary"), which included Transylvania, showed "Uniat Greek 1,843,634...Orthodox Greek 2,799,846). 30 years earlier, the figures I've seen on the population of Transylvania are 31% Orthodox Romanians, 28% the RCUwR,GC. At the eve of the war the CE (Supp. I vol. 17, p. 385) figures for Hungary are "2,008,000 Uniat Greeks...2,004,000 Orthodox Greeks...As a result of the War about....Catholics [of whatever rite]..1,008,000 went to Rumania...since the signing of the Treaty of Versailles there are....158,000 Uniat Greeks...77,000 Orthodox Greeks [in Hungary]. On Rumania [sic] the supplement (p. 644)claims "in 1918 9,695,714 belonged to the Orthodox Church; 1,456,147 were Greek Catholic, 1,483,929 were Roman Catholic." The figures for 1930 in Romania were 1930 Orthodox 13,108,227 (72.6), Uniate 1,427,391 (7.9) Latin 1,234,151 (6. . These figures comport with others I've seen elsewhere. The Suppliment on "Fogaras" (pp. 311) states that "the Hungarians either imprisoned or interned many priests and layman, and some died during their internment." It also elsewhere mentioned the persecusion by Communist Hungary before the Romanians overthrew Bela Kuhn. To come up with 2 million would require a 37% increase in 30 years, whereas Romania only increased in the same period 6.6% (14,876,787 to 15,872,624: there is the problem that teh frist figure includes Bessarabia and N. Bucovina, later lost: the total without these territories was in 1930 14,280,729 (with them 18,057,028)). These do not factor in the WWII casualties. In other words, massive conversion or birthrate of the Romanians attatched to Fagaras, neither of which is found in the contemporary records (in fact, the opposite trend is seen), would be needed to come up with 2 million. The "Roman Catholics" were mostly Hungarian and Germans, a point that I found odd that the "Catechism of the Catholic Church" translated into Romanian was available long before the English was, in fact nearly right after the first (French) version was available. And it was flooded in Bucharest: I saw adds and copies of it everywhere in 92-93. Now, since not only does the Vatican have a minority in Romania, its flock speaking Romanian is a minority within a minority. Yet the Romanian CCC seemed a priority. This, after the pope of Rome had said that if the Romanians were really Roman, they would be "Roman Catholic." But back to the properties: when Transylvania was reunited with Romania, the RCUwR,GC was declared by the constitution to be a second Romanian church, with preference before all other faiths except the state Orthodox Church. As such, it was highly priviledged. That however wasn't enough, and the King-himself a Latin rite communicant of the Vatican (the pope had hoped for him to be the instrument of another "union" scheme)-made an unconstitutional concordant with the Vatican which gave the RCUwR, GC a status superior to the Orthodox Church, e.g. receiving the patriomony of the Hapsburgs (stolen from the Orthodox) as its own. This was a consitent bone of contention. The issue now is that the RCUwR,GC is denying that anyone was ever forced into union, that the Orthodox properties were ever stolen, that the Hapsburg enriched their church at the expense of the Orthodox-ill gotten gain that the RCUwR,GC was allowed to keep under the unconstitutional concordant. And the fact that the vast majority of its former communicants see no reason to apostacize again from the Orthodox Church, despite aggressive proseltizing. As a side note, the Vatican's Ukrainian church in Romania was allowed to go on. I see the link is not on line anymore. Marirea Dumnezeului for the way back machine! My paper analyses the activity of the Apostolic Nunciature in Romania with a special attention to the Italian representatives of the Holy See in Bucharest, and to Romanian Italian prelates and clergymen between 1945 and 1950, pre-eminently in the lights of the Romanian Secret Services’ documents. Therefore, this study does not aim at providing a complete chronological and theoretical account of the period. It may be useful in the following introductory paragraph to sketch some of the general features of the diplomatic relations between the Holy See and Central and Eastern European countries from the Soviet-controlled area immediately after World War II. For the Soviets, the Roman Catholic Church was an “international organization”, while the Holy See was an important ally of the American “imperialist”, facts which were unacceptable in their eyes. The Communist governments from Eastern and Central Europe sought to restrain and then even to suppress the communications between the Holy See and local Catholics, therefore the activity of the Apostolic Nunciatures from these countries began to be closely supervised even as early as 1945. In Albania the Holy See’s representatives were accused of collaboration with the Fascist occupiers and were unscrupulously driven away immediately after 1944. The Holy See continued after 1944 to recognize the legal Polish authorities which remained in exile in London, but the Communist government from Warsaw treated more carefully the Polish Roman Catholic Church in comparison with their Central European neighbor “comrades”. Nevertheless, the Concordat was denounced by the Polish authorities in September 1945. Although in Romania the Concordat - which had been ratified in 1929 - was unilaterally revoked only three years later on July 17, 1948, it was many times infringed and avoided after the Communist takeover in March 1945.
inhabitants to Roman Catholicism. Some Romanian Greek Catholic monks (former Orthodox) pleaded vigorously for the religious union of Orthodox Church with Rome and their actions were sustained especially by the Prayer’s Front, a Catholic initiative animated by the Romanian Italian professor Iosif Frollo and msgr. Vladimir Ghika. The Intelligence services were aware about their initiative and therefore intensified their actions for supervising of the Apostolic Nunciature and Catholic and Orthodox prelates in order to prevent the possibility of an anticommunist “alignment” of the two Christian Churches. the Romanian government would like to remove Nicodim from his high ecclesiastical office and to create a “group of Church diplomats” with the aim to direct firmly the Romanian Orthodox Church towards East (i.e. Russian Patriarchy). The authorities gave a clear warning, including to the Romanian Orthodox Church during the “war criminals trial” in spring of 1946. Thus, the position of Andrea Cassulo as diplomat and of his colleagues and Orthodox interlocutors became very uncomfortable, especially when the Communist authorities tried, for political purposes, to implicate and compromise him during the Marshal Antonescu’s trial judged by a Special Court in June 1946. Since msgr. Andrea Cassulo became a sort of persona non grata in Romania, the Holy See sought to avoid the worsening of the diplomatic dispute and decided in 1946, much to the regret of the Romanian Catholic community, to nominate the internuncio Gerald Patrick O’Hara, former bishop of Savannah, as successor. Nonetheless, the appointment of an American prelate as Holy See’s representative in Romania generated great hopes among the Romanian Catholics concerning a firm action of the Vatican. Despite the hostile messages sent by the government, Nicodim did not give up and maintained a normal relationship with the Vatican prelates in Romania, and before Andrea Cassulo’s departure the patriarch and the former nuncio had tears in their eyes. In spite of the “quarantine” imposed by the Government against him, Andrea Cassulo sought to contribute to the safety of the Roman Catholic Church and maintained the contacts with the Romanian people, especially with the political and diplomatic milieus, until his departure in March 1947. Another Holy See diplomat of Italian background who worked for the Apostolic Nunciature in Bucharest as secretary was Guido del Mestri de Schönberg. After his expulsion from Romania he was for a long time apostolic nuncio in Germany; in 1990, he returned in Romania with the occasion of the reopening of the Apostolic Nunciature in Bucharest. Catholic Church did not give its blessing to the Communist regime, and this hostile attitude was accompanied by the support of some subordinate laymen groups - the Association of the Greek Catholic Romanians (AGRU) and the Association of the Romanian Greek Catholic Students (ASTRU) - in favour of the anticommunist oppositionn. Moreover, the Secret Service’s report noted on March 1, 1946 that ASTRU (organization which supported actively the Prayer’s Front) received through the agency of msgr. Vladimir Ghika “a substantial subsidy” from the Apostolic Nunciature. Thanks to this fact, Andrea Cassulo was very interested in the activities of ASTRU, concluded the SSI report. In reply, the Communist appealed to obedient organizations and even the small Catholic Italian community in Romania did not escape from the state authorities’ pressure which pleaded for “enlisting” in the Communist or pro-Communist associations. Among the major figures of the Romanian Italian community was Antonio Mantica who came in Romania in July 1913 sent by the Vatican, but approved and paid by the Italian government as priest of the Italian Catholics of Bucharest. He belonged to the diocese of Vicenza and was for a few years missionary in Sudan; he remained for three decades priest of the Italian church of SS. Redentore in Bucharest. After their takeover the Romanian Communists encouraged the foundation and development of the Italian Patriotic Union, an obedient organization which had the aim of dividing the Romanian Italian colony. Faced with this attempt of penetrating the Italian community, the Apostolic Nunciature decided to intervene and actively supported the creation of a rival association – the Catholic Italian Group, animated by padre Antonio Mantica, the priest of the Italian parish of Bucharest. This Group received an significant support from the Italian Legation and from important members of the Italian colony in Romania: Valerio Ongari, Giovanni Villa and Umberto Ricordini. Probably, the Romanian Communists perfidiously relied on a religious feud, as well. For instance, in Southern Bukovina the German and Hungarian Catholic population had left in 1940 and after 1944 its Catholic churches were occupied by the Orthodox faithful. The authorities had allowed Orthodox to use the Catholic churches but they deliberately neglected the property right of the Roman Catholic Diocese of Iaşi. Andrea Cassulo was concerned that the Communists might ignore sine die the Catholic properties, so he pleaded for the recognition of the property rights of the Roman Catholic Bishopric of Iaşi. Catholics to Roman Catholicism during the World War II. The nuncio, “a good friend of the Hungarian prelate from Alba Iulia” – as insinuated by the SSI - refused to make a decision alone and sent the case to Vatican for a resolution. However, it goes without saying that such information must be confirmed by other sources because now we hold also favorable Greek Catholic opinions on Aron Marton. The Romanian officials just like their Soviet masters estimated that the Apostolic Nunciature in Bucharest was a sort of Intelligence Agency (or even Espionage Department of the Vatican in the Communist speech). For example, a leading Romanian Italian clergy exponent after 1944 – msgr. Andrea Iovanelli - was blamed in the spring of 1946 by the SSI for organizing an ecclesiastical, political and social Intelligence Department. According to the SSI agents, the headquarters of this “Department” was right at the Apostolic Nunciature led by an other Italian – Andrea Cassulo. The Catholic priests were frequently charged for using espionage channels. After Andrea Cassulo’s departure the Secret Services blamed Gerald Patrick O’Hara and his colleagues Guido del Mestri and John C. Kirk for the continuation of the “spying activity”. Such accusations were repeated in a shameful booklet entitled Vatican – a meanly tool of the warmongers, edited by the Romanian Workers’ Party Publishing House which stated that “the Roman pope has in its service an entire network of agents – Catholic priests and missionaries whose job is to spy and to send regularly reports to the Vatican […]. The Vatican became the most important center of espionage and spying training from the entire world”. Therefore, many clergy were injailed especially from the beginning of the summer of 1947.
religious communities abroad, except with permission of the Ministry of Religious Cults and through the Ministry of External Affairs. Through the agency of the Apostolic Nunciature in Bucharest the Holy See vehemently protested in 1948-1949 against the suppression of the Romanian Greek Catholic Church and condemned the violation of the religious freedom, but the Communist authorities (especially the Romanian Ministry of Foreign Affairs) decisively rejected these justified accusations as “interferences” in the internal affairs of a sovereign and independent state. Moreover, repeatedly the Romanian Communists infringed the elementary diplomatic practices and conventions: they illegally denounced the Concordat and in May 1949 the diplomats’ freedom of movement was drastically restricted. On December 27, 1949 padre Antonio Mantica was summoned at the Ministry of Interior headquarters where he was practically arrested for 5 days. After psychic and physical pressures he accepted to declare publicly that he would leave “spontaneously” the country and not after an expulsion decree. He left Romania on February 7, 1950 and after his expulsion the Italian church S.S. Redentore remained without a priest. The internuncio O’Hara and Scammacca del Murgo, the Italian ambassador in Romania, asked father Clemente Gatti whether he accepted to be the priest of the Italian colony in Bucharest. He was enthroned on February 11, 1950 but he did not have the title of parish priest. After the banishment of the Apostolic Nunciature’s diplomats, Clemente Gatti also received, on January 1, 1951 an order of expulsion without any motivation. Although the Italian Legation obtained a postponement, on March 3, 1951 the Italian Ministry of External Affairs gave clear instructions to its Legation from Bucharest to demand to Clemente Gatti to leave Romania immediately. Since padre Clemente Gatti refused to obey, he was arrested on March 8, 1951. As Pedro Ramet stated, for Marxists, religious policy and nationalities policy were parts of an organic whole. After 1948 a furious anti-Western campaign was unleashed in Eastern and Central Europe, whose aim was to destroy the Western cultural values perceived as decadent and depraved: British, French and Italian Institutes and Libraries were closed by the Communist governments and the citizens of Western background (French, Italian, German etc) suffered, too. Thus, the fate of the Italian and Romanian Italian clergy is not surprising. establishment and as a proof they invoked the nomination of American apostolic nuncios in Eastern Europe: Gerald Patrick O’Hara in Romania and Patrick Hurley in Yugoslavia. In this anti-Catholic and suffocating climate Andrea Cassulo’s successor Gerald Patrick O’Hara was forced to leave Bucharest on July 7, 1950. He was practically expelled. It is obvious that after 1945 the Holy See tried to counteract the Soviet anti-Catholic policy but we believe that it is an exaggeration to assert that the Vatican could “exert pressure” on Romanian Orthodox Church hierarchy for religious union with Rome, as some historians recently stated. The Holy See’s diplomats in Romania were even since 1945 the object of a strong distrust because the pro-Communist government began to consider the Vatican as a “bulwark against Communism”. The ideological clash between the Roman Catholic Church and the state had important political consequences. The Communists interpreted the lack of political support of the Catholic Church as forbidding Catholic priests to engage in the “democratic” policy and therefore the Catholic clergy were labeled “reactionary” and “imperialist” like their “masters” from the Vatican, and especially after 1948 they have been charged with collaboration with the American and Vatican spies, and they spent years in Communist prisons. In recent years researchers have gained acces to new archival materials which revealed the brutality and the persecutions against the Romanian Catholic clergy of all rites. At the same time the Communist Eastern and Central European Parties tried to convince their Roman Catholic Churches to break the canonical links with the Vatican and to transform them into “National Churches”. These attempts, a prelude to a future subordination, were firmly rejected by the Catholic hierarchy. The Communist intentions were rapidly deciphered by the Catholic prelates and representatives of the Vatican in Eastern and Central Europe. For example, early in the winter of 1946, Andrea Cassulo was aware of the fact that “the Soviet government has in its view, trough the agency of a skilful action, the creation of dissident Polish Roman Catholic Church which will break its ties with the Vatican and will become, for form’s sake, an autonomous Catholic Church, but in fact a Russian Patriarchy’s subordinate” [42 ]. Unfortunately for the Roman Catholic Church, the Western allies recognized the Soviet Union’s claims to pre-eminent influence in Eastern and Central Europe, thus the Holy See had no possibility to intervene in this part of the continent. For this material, permission is granted for electronic copying, distribution in print form for educational purposes and personal use. I do not feel I have faith to a church as much as I have Faith in Jesus Christ , I understand the issues that separated us 1000 years ago and wish that we would reconcile our differences. I love my church and feel that it is right in the position that it took over the supreme leader or Pontiff . I know that there were many wrongs done and both sides have valid issues. However we both believe in the same Gospels and there is only one God. There are many who believe as you do and thank you for having the courage to speak out!! 1. If you are going to receive communion in the Catholic Church, when you do, you should then confess it as a disobedience, for in these times of schism, without the blessing of an Orthodox bishop, you are committing the sin of disobedience. The issue will then arise as to your commitment to be obedient and you may legitimately call upon the primacy of your conscience and the salvation of your soul. That is not a game as long as you truly desire to be obedient but also want to be obedient to the words of Jesus in the Gospels where he calls for unity in the Body of Christ. If you believe that your Catholic brothers and sisters are closest to you in faith, and you are not alone in Orthodoxy in believing this, then for the time being the greater weight of the sin of disobedience lies in the willed perpetuation of the schism. Thank you too, however I believe in Jesus above any priest or denomination, maybe this is what he refereed to brother against brother. The difference I see with it is that we are both on the same page as far as being Christians . There are many who are far apart from us and I make them welcome in my house as I will try to love them as myself. I see your point of obedience to my church and you may be right that I should humble myself . My issue is that in my heart I believe Jesus would attend both churches and does every week.I am going to be judged by Jesus and God , my Priest and parishioners , or the bishops will not be there. I agree with you. There are times when righting a moral wrong means moving against a man-made law. Hitler's Reich accomplished much evil which, at the time, was precisely legal. The Third Reich was a legitimate government, possessed of unspeakable evil. There's a story that circulates about an eastern Catholic bishop who said [paraphrasing] that if it is legal it is moral!! That is not an unusual sentiment among us as Christians, and it is terrifying to me at some level. Orthodox believers will mock the Catholic Church for her legalism and turn around and crucify one another verbally on some of the most minute points of law that I have ever seen. So I am with you on this one, and you may well be right. If it flies in the face of the Christ's wish that we be one, then perhaps those bishops on both sides of the Catholic-Orthodox schism indeed are not exercising the legitimate authority of Christ to do as they do, which serves to prolong the schism, and if the authority is not legitimate in this case, but sinful, then you have the right of it to do as you do. If it flies in the face of the Christ's wish that we be one, then perhaps those bishops on both sides of the Catholic-Orthodox schism indeed are not exercising the legitimate authority of Christ to do as they do, which serves to prolong the schism, and if the authority is not legitimate in this case, but sinful, then you have the right of it to do as you do. The Orthodox bishops that I know, particularly a GOA bishop that regularly participate in Orthodox-Catholic gatherings, would be delighted to welcome anyone to return home to the One, Holy, Catholic and Apostolic Church. It's simply that we disagree on where that is to be found. In the history of the schism, that position has been sometimes less and sometimes more rigid. It has varied from place to place as well as from time to time. Which is why, of course, that I've said there has never been a monolithic and rigid position on either side. It seems to me that we are in a period of good faith dialogue. What comes out of it, of course, is yet to be seen but if it does continue apace and improves, then all those rigid Catholic and Orthodox bishops are going to either have to schism again or find a way to relax their rigid positions...seems to me. And you still haven't distinguished that from other moral lapses of the clergy. Btw, very odd how you challenge my authority as an Orthodox Christian to repeat the statements of the Orthodox Episcopate of the Catholic Church, but encourage "Sinful Hypocrite" in arroganting to himself the power to judge the Orthodox Episcopate of the Catholic Church because he doesn't like their statements of the Faith. But then again, maybe not odd, typical and expected. It seems to me that we are in a period of good faith dialogue. What comes out of it, of course, is yet to be seen but if it does continue apace and improves, then all those rigid Catholic and Orthodox bishops are going to either have to schism again or find a way to relax their rigid positions...seems to me. Or those laxidasical bishops can get together and maybe catch up with the Anglicans. You take it farther than it is intended. Out of context. Arrogance is your forte as my name implies my stance overall here. I have already agreed to being a hypocrite. I am not making judgments of either as to which is better or right or wrong .I stated God loving both and Jesus attending both equally. I am subject to judgment but God said he would handle that not you or me or catholic or orthodox.I believe that it is simpler than you want to make it. I love Jesus and he and God will judge us . I have learned much through my Greek Orthodox upbringing and I applaud and respect that , But I must not look down on Catholics or others and separate myself from them because of errors and arguments that are long ago and overdo for forgiveness and confession. I cannot be held responsible for your sins any more than you are held to mine.If we say we both believe in Jesus dying for our sins and rising on the third day , and we say the lords prayer together and have communion together and speak of the holy spirit moving within our souls together than You are the one who is lost when you find fault with that ,not me as far as what the gospels and the church teaches.I do not fear men is what Jesus said, you are all the same as me , a man to be judged by Jesus and God. And he will not judge us by denomination because he said we were all to be one nation. Jesus Christ son of God have mercy on us. I was really touched by reading this post. We need more people like you not only on this forum but on the internet in general. I can tell you that it woke me up and made me realize how far off my conduct is at times and how much in need of God's mercy I am. Thank you for this. Your kindness and humility is definitely a powerful witness. I love Jesus and he and God will judge us . Which Jesus is it that you are referring to? Because I have a sneaking suspicion that we're not talking about the One of the Orthodox Church but rather some imagination or perception you have picked up from somewhere else. Arius, Nestorius, Appolianrius, Sabellius, Donatus, etc. etc. etc. would use the same "synchretistic" language you would, and they have been Anathematized by the One Holy Catholic and Apostolic Church. Again, which Jesus is it that you are referring to? than You are the one who is lost when you find fault with that ,not me as far as what the gospels and the church teaches.I do not fear men is what Jesus said, you are all the same as me , a man to be judged by Jesus and God. Wow...I'm not even sure what this means. He will not judge us by denomination BECAUSE we are all one nation? How are we exactly one Nation when we don't even profess the same exact understanding of this "Jesus" you speak of. As one professor of mine famously said: Jesus Christ is not "the big boss upstairs" not just because that's a ridiculous statement but because it totally tramples on the magnificence of what His Incarnation has done for our humanity. I think for this very basic reason, we need to be MUCH more careful about throwing the "Jesus" word around and assuming that everyone agrees with how it is being utilized, either by you OR by me. I'd be interested in any support for this assertion. Since my understanding is that the official theological (as it were)position of both has always been clear:"There is only one Holy, Catholic and Apostolic Church. We're it and you're not." That seems to me to be pretty monolithic and rigid. Depending on your definition of monolithic and rigid, I guess. There is only one way to do that - the RCC and the OC are so different that one side or the other is going to have to say that they were wrong. There is a recent topic on a single Orthodox catechism on this board which would be instructive when trying to figure out what is any "official theological" position of universal Orthodoxy. And I am sorry that you feel the way that you do but I am glad that not all Orthodox bishops join you in this approach to the resumption of communion. So evidence for the assertion is that there is no Orthodox catechism? I'm sorry, but do you really think so? I don't "feel" one way or another about this. It is a simple statement of fact: these are two totally different churches. Either the Pope is infallible or he isn't. Either he is the "first among equals" among a synod of bishops, or he isn't. Either the Creed contains the filioque or it doesn't. Etc. Would the RCC bishops or cardinals be willing to concede that they were wrong about any of those or similar issues? What I think is that the conversation on the topic of catechisms says a great deal about claims to being a monolithic Orthodoxy. I also know historically that there was not a monolithic approach to the Catholic Church on the part of Orthodoxy...as you claim there has been. And if what you say about some of the expressions of faith between us is worthy of schism then I am surprised that Orthodoxy conducts the current dialogues between us in such bad faith and with such flagrant dishonesty. Priests who knowingly choose to commune any non-Orthodox, which includes members of the RCC, are violating the canons of their Church, and if their Hierarch finds out, they will be in trouble. How monolithic is that for you? Well, aside from the fact, that such a deduction from my statement requires mental zigzagging that leave me breathless, it's not bad faith and dishonesty. We're witnessing to our erring brethren and praying and hoping that they will see the light and all return to the One True Faith. Oddly enough, though, I agree with you now. With such bad faith and poor opinions, and unsupported assertions, as demonstated, there probably isn't any hope for dialogue, and I wonder why they waste their time. What I think is that the conversation on the topic of catechisms says a great deal about claims to being a monolithic Orthodoxy. Let's see, it was 28 apostate bishops who signed at Florence, and the rest of their Orthodox (coreligionists) rejected it. And that's not monolithic enough for you. I also know historically that there was not a monolithic approach to the Catholic Church on the part of Orthodoxy...as you claim there has been. Yes, straining gnats to find exceptions to make the rule to swallow the camel. I have nothing to add to Katherneofdixie's treatment of the matter. I was saying even if you don't have access to a particular church of your own communion, I still don't see what would be the point of taking communion in another communion. He believes you would receive unto Gehenna. He would give it to you if you would be willing to be Chrismated. No, the point he is saying that if you are not in communion you cannot receive the grace of the communion. Right, and even beyond that if we believe that communion is just Grace, then couldn't I just stand in a church and receive communion? I mean...the Holy Spirit Blows where He Wills, right? So that grace could be anywhere. Is anywhere in communion? By saying that Holy Communion is just grace you cheapen Holy Communion and what Christ did for us through His death and Resurrection. This I think should give you a sufficient place to start and truly examining your theory of "grace"
But you are a chosen people, a royal priesthood, a holy nation, a people belonging to God, that you may declare the praises of him who called you out of darkness into his wonderful light. An holy nation - This is also taken from Exodus 19:6. The Hebrews were regarded as a nation consecrated to God; and now that they were cast off or rejected for their disobedience, the same language was properly applied to the people whom God had chosen in their place - the Christian church. I read the same Gospels as you , Every version I have ever read has the same Jesus saying the same parables as you have read . Your attempt to mock me is fine but we should be clear that there are four gospels and what christian Church does not read them? The Church's I speak of are all based on the Gospels of Matthew ,Mark, Luke, and John. And they all read the same stories as I read there. Thank you Wyatt, You are like an oasis in the wilderness. God bless you my friend. Peter took him aside and began to rebuke him. "Never, Lord!" he said. "This shall never happen to you!" Jesus turned and said to Peter, "Get behind me, Satan! You are a stumbling block to me; you do not have in mind the things of God, but the things of men." No, the One, Holy, Catholic and Apostolic Church. And people can still be cast off and rejected for their disobedience to that Church. He writes the same way in all his letters, speaking in them of these matters. His letters contain some things that are hard to understand, which ignorant and unstable people distort, as they do the other Scriptures, to their own destruction. Therefore, dear friends, since you already know this, be on your guard so that you may not be carried away by the error of lawless men and fall from your secure position. i.e. communion in that One, Holy, Catholic and Apostolic Church. Your attempt to mock me is fine but we should be clear that there are four gospels and what christian Church does not read them? Why stop there? The Mormons read them, the Muslim polemicists read them, the "higher critics" etc. read them. The Jesus seminar reads them. The Church's I speak of are all based on the Gospels of Matthew ,Mark, Luke, and John. Church is singular. One, Holy, Catholic and Apostolic Church confessing the Orthodox Faith. And while you are speaking of, we are speaking for that Church. And they all read the same stories as I read there. As St. Peter warns us in Scripture. Maybe if you hadn't wandered out of the Land of Milk and Honey, you wouldn't be lost in the wilderness in need of an oasis. You are the most lucky and blessed sinner ,to never feel lost in a world of hate. You are never chased out of the temple by an angry mob like Christ , maybe you are a prophet in your village? With what propriety can the pretended successor of Peter - the pope - undertake to expound those difficult doctrines in the writings of Paul, when even Peter himself did not undertake it, and when he did not profess to be able to comprehend them? Is the Pope more skilled in the knowledge of divine things than the apostle Peter? Is he better qualified to interpret the sacred writings than an inspired apostle was? No, I"ve been threatened with death by Muslims in the Muslim world as I dare to prefer the Son of God over their "prophet." So while you have enjoyed it seems the luxury of fuzzy feelings, I've had to grap hold to the Rock on which I stand. Ordained? By whose authority? Certainly not the inspired Apostles'. I'll let your friend Wyatt dialogue on your views of the pope based of Barnes' distortion of scripture. I've had to grap hold to the Rock on which I stand. You stand on the Pope ?! Ialmisery, what is this icon? Can you interpret it? 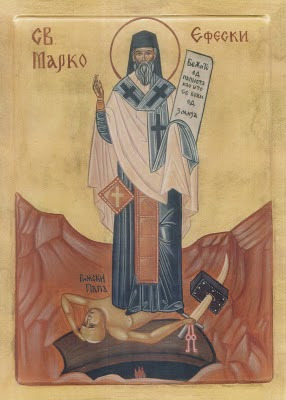 St. Mark of Ephesus standing on the "Roman pope," who is combined with some imagery of the beast in Revelation. I suppose I should take great comfort in the fact that the Catholic Church has not produced such abominations and called them holy icons. On the other hand, if you really wanted some imagery depicting Vatican as The Great Whore and the Pope as Antichrist (or was it the Beast ? ), you should look no further than the writings of Ellen White. That stuff could inspire you, perhaps take up the brush yourself. I don't know. I didn't post it. , you should look no further than the writings of Ellen White. That stuff could inspire you, perhaps take up the brush yourself. No, I'll stick with the pillars of Orthodoxy. ...we should be clear that there are four gospels and what christian Church does not read them? The Church's I speak of are all based on the Gospels of Matthew ,Mark, Luke, and John. And they all read the same stories as I read there. They may all read the same stories, but they understand/interpret them (and apply their understanding) in sometimes vastly different ways. The Jesus of the Mormons, for example, and the Jesus of the JWs is not necessarily a Jesus that you would recognize. A number of EO believe in Toll Houses and so it would be somewhat hypocritical to attack the RC belief of Purgatory. Page created in 0.287 seconds with 26 queries.